The “bible” of the American book publishing industry is Publishers Weekly. Most of what you need is online, but a subscription is valuable for the dedicated observer. The “bible” of the UK book publishing industry is The Bookseller, “At the Heart of Publishing since 1858.” They keep even more content behind the firewall than Publishers Weekly. Subscriptions cost north of $200. The “bible” of the Canadian book publishing industry is Quill & Quire. Subscriptions here. Devoted North American trade industry observers also subscribe to Publishers Marketplace. Editor Michael Cader understands the business of the book business better than any other publishing industry reporters, keeps track of rights sales, and has a great directory of industry players. Annual subscriptions are $275. Next up is tracking the industry associations. They offer very inconsistent quantities of data. But you need to know the ones that matter. The voice of the biggest players in the U.S. is the Association of American Publishers (AAP). Small publishers sometimes join the Independent Book Publishers Association (IBPA). IBPA is far more hands-on than the AAP; members get access to the good stuff they publish and report. The IBPA is also, increasingly, the voice for professional self publishers. The Book Industry Study Group (BISG) helps set standards, and supports research and events. There’s some good analysis available, and great networking opportunities, but membership is too pricey for most individual industry observers. My blog post on the three top self-publishing industry analysts is here. Jane Friedman and Joanna Penn and Porter Anderson are must-reads. A few of my favorite industry blogs: The Shatzkin Files (although Mike Shatzkin is officially retiring from publishing and blogs less frequently), The Digital Reader and Author Earnings. This article was last updated in 2017, from a piece first published in 2013. Lots of it is still valid; lots is stale. Read with care. According to Bowker, the book publishing industry bible, the number of titles self-published in 2013 increased to more than 458,564. Head over to Amazon.com’s home page for books and look down the left column. Click “New releases –> last 90 days” and marvel at the number. It’s “over 1,000,000” as I write this in February 2018; last 30 days it’s “over 500,000”! Nielsen BookScan, quoted in the June 2007 Harper’s magazine (subscribers only), reported that nearly 1.5 million different titles were sold in the United States in 2006, although 78% of those titles sold fewer than 99 copies, while only 483 titles sold more than 100,000 copies. A ground-breaking 2005 report (no longer online) by the Book Industry Study Group (BISG) revealed that there were 62,815 active publishers in the United States, and that 46,860 of these publishers had revenues below $50,000 per year. (Most observers would have placed the number well below 5,000; in 2002 the U.S. Census reported 3,570 book publishers.) In 2006, using a slightly different methodology, the BISG reported that there were in fact 88,528 “active” publishers in the U.S.—nearly 68,000 had sales under $50,000 per year (no longer online). With all of the demographic changes in print readership, the book publishing industry has weathered the challenge, in part through the publication of more specialized titles in shorter print runs, in part through increased publication of “non-books” (novelty titles) and in part through improved distribution, including via the web. In the separate section on Education I cover the textbook industry. Growth has stalled, profits are plunging, and the move to new electronic media poses a serious challenge to this $20 billion industry sector. Despite some modestly positive trends, the underlying basis for a successful future for the book publishing industry is rapidly being eroded. As reported below, reading rates are dropping, and average annual household spending on books dropped 14% between 1985 and 2005, adjusted for inflation. On the other hand, ebooks are a thriving part the industry, both substituting for and augmenting print sales. My overall rating for the future of book publishing is a continuing modest decline in total sales volume, but certainly not an impending catastrophe. What is it about books that make them the sine qua non of publishing? I think it’s very simple. Great books have changed lives, have changed history. While there have been innumerable articles of great importance in magazines and newspapers, let’s face it – they don’t have the force of the classics of literature and non-fiction. Just about any reader can point to a book that has changed his or her life. Most of us can point to many different books that have had an equally strong impact. We encounter these books at different ages. I know that many of the books I read when I was only 10- or 12-years-old made a huge impact then and still influence me today. The whole context of reading as a child was a unique emotional experience. As I grew older, I found books that suited my age, and continued to grow and mature with the extraordinary literature at my disposal. Further, since Andrew Carnegie’s philanthropic efforts, there has always been a great infrastructure for enjoying books. Most cities in North America have many fine libraries and bookstores. Books are everywhere! Supporting them also was a robust film industry that interpreted books in unexpected ways; as often as not driving us back to the original written version. I fully entered the world of books in the early 1970s via book publishing, first as a bookseller, then as a traveling book sales rep, and then as a publisher. I still have very strong feelings about book publishing: most of the people I know who work in the book publishing industry feel as strongly. It’s hard to get publishing out of your blood. Book publishing is not the first form of publishing by any means – think cave drawings, scrolls and those dedicated monks with their beautiful manuscripts. But somehow book publishing has come to embody the idea of publishing more than any other form—when I say “publishing” you probably think books (perhaps even if you happen to be a newspaper publisher). Yes, for most of us, books hold a unique emotional place in our hearts and minds. When it comes to imagine the so-called “death of print,” we react in unison: Perhaps some kinds of print, but not books! What about all of the books for children, those marvelous classics. Surely they won’t disappear? The bestsellers we read in hardcover and paperback; the fine non-fiction biographies and histories. These can’t disappear, can they? Nearly all of us who are close to printing and publishing romanticize Gutenberg’s invention of movable type (circa 1450) and cheerfully ignore the context that surrounded it. We cheerfully ignore the fact that printing was invented in China long before Gutenberg got near his printing press, and that in Korea a system of printing from movable metal type was developed around 1041. Not surprisingly, the history of publishing is well-documented in books. One such, a fine work, The Nature of the Book by Adrian Johns (The University of Chicago Press, Chicago, 1998), illustrates in 753 pages the very commercial nature of the book trade from its earliest days. Book publishing today is very much a descendant of those early efforts. It remains inescapably a commercial enterprise. Certainly some not-for-profit groups, associations and government-subsidized efforts reduce the commercial pressure on their publication efforts as money-making ventures. But the vast majority of book publishers worldwide undertake their tasks with at least one eye on the bottom line, and this necessarily has a great impact on how the business of book publishing is conducted. I’ll examine shortly the statistics that bear on these challenges. Some of them have changed in the last decades; many still apply. Much more interesting to consider is the impact of the Internet on the creation, marketing, distribution and sale of books. The Internet is having an enormous impact on the future of book publishing – both in positive and negative ways. I’ll examine this trend also. At the same time there are other forces at work: eBooks, print-on-demand, the digital scanning of vast libraries and the conversion of certain books into other electronic formats. Each of these is playing a part in securing a fascinating future for my beloved The Wind in the Willows. Technology need not be destructive for book publishers; it can be a very positive force for change. There are many kinds of book publishing. Most listings differ, but here is a representative sample of publishing types. 4. Reports, studies, etc. by not-for-profit publishers, government agencies, etc. No discussion of book publishing can be authoritative without recognizing its varied species. … although reference publishers don’t always publish in either book or journal form. Read his complete post for more. According to Hoovers “the US book publishing industry consists of about 2,700 companies with combined annual revenue of $25 billion. Large US publishers include McGraw-Hill, Pearson PLC, John Wiley & Sons, and Scholastic. Some of the biggest publishers are units of large media companies, including HarperCollins (NewsCorp), Random House (Bertelsmann AG of Germany), and Simon & Schuster (CBS Corp). The industry is highly concentrated; the top 50 companies hold 80 percent of the market.” This book industry report points to two different aspects of the industry: first, that there is a high degree of concentration at the top of the pyramid, and two, that most book publishing analysts grossly underestimate the size of the industry in the U.S. As pointed out above the Book Industry Study Group claims that in 2006 there were in fact 88,528 “active” publishers in the U.S., and nearly 68,000 had sales under $50,000 per year. AAP latest U.S. book sales estimates can be found at the link above. An article in Wikipedia entitled “Books published per country per year,” covers 123 countries, quotes from various statistical sources (not all of them current), and estimates that some 1.2 million titles are published annually worldwide (this based on UNESCO data). One figure for worldwide book sales is from John Kremer, who writes, without quoting sources, “In 1995, world book sales reached $80 billion. Worldwide book sales are expected to hit $90 billion by the year 2000.” As Kremer states that U.S. books sales were $25.5 billion in 1995, then the ratio of U.S.-to-worldwide sales was about 1:3. I would expect the ratio has increased somewhat in the last 12 years, and so using BISG’s 2008 U.S. sales figure of roughly $40 billion, worldwide book sales should be in the $135-$150 billion range. Based on the U.S. figure of over 62,000 active publishers, one wonders if the Canadian figure should not be closer to 6,000 than 1,000, judging by the standard 10 to 1 ratio that holds for most industrial comparisons between the two countries. Canadian Books in Print listed 4,300 book publishers in the year 2000. Hoovers also remind us that “demand for books…is largely resistant to economic cycles.” As I discuss in my blog entry “Economics and the Future of Publishing,” this recession is thus far proving different, and the eventual outcome for book publishers remains to be seen. The Association of American Publishers is the major trade group representing “America’s premier publishers of high-quality entertainment, education, scientific and professional content – dedicating the creative, intellectual and financial investments to bring great ideas to life.” It has 300 members and so is representative of mainly the largest publishers. Next up is the Independent Book Publishers Association serving some four thousand smaller book publishers. In Canada, the Canadian Publishers’ Council represents the 18 largest publishers, primarily the large foreign-owned subsidiaries, that “collectively account for nearly three-quarters of all domestic sales of English-language books.” The Association of Canadian Publishers is “the national collective voice of English-language Canadian-owned book publishers”, representing 135 Canadian-owned and controlled book publishers from across the country. The Literary Press Group of Canada represents about 60 Canadian literary book publishers. Christian publishers have several associations, as do other specialized publishers. 1. Individual editors and/or publishers make individual decisions about what will or won’t be published by their firm (at larger companies, a larger group may be involved in the decision). This, as much as anything I believe is the cause of the transformation and decline of book publishing in the modern era. Who are these editors and publishers who have so much power to make life-and-death decisions on what books will or won’t be published each year? They may have some kind of education associated with the history and/or practice of writing and literature. This ostensibly makes them “expert” in what constitutes “quality” in writing. But of course they are as susceptible as the rest of us to individual matters of taste, to bias and to lapses in judgment. Still their role within their respective companies is god-like – they make judgments of life or death, except in this case upon what will be published, rather than who will be sent to hell. Furthermore, at the largest book publishers the decision is no longer generally about quality but more often about salability. Is that taught at Swarthmore? Publishing courses are now abundant. Who really believes that you can take English majors in their twenties and “teach” them how to intuit what will be this year’s bestseller? Twaddle. Ernest Hemingway is reputed to have told George Plimpton during an interview that he rewrote the ending to A Farewell to Arms 39 times before he was satisfied. “Why so many rewrites?” Plimpton asked. So while I argue above that editors can offer blocks to the publication of worthwhile books, in their key role, that of helping authors improve their texts, they are invaluable. That has been my consistent experience. The tales of great editors are legion, such as Maxwell Perkins and his role in shaping F. Scott Fitzgerald’s prose. But a merely good editor can work magic also. While many very poorly-written and poorly-edited books have become bestsellers, this doesn’t obviate the general rule: a book written (and/or edited) with clarity in mind will succeed beyond a similar text that lacks such clarity. 3. The book industry has traditionally been a retail-based industry. Books are mostly bought in bookstores. The explosive growth of the major chain booksellers in the 1970s and onwards was continually lamented as representing some sort of “death of publishing.” That dire prediction on the future of book publishing proved untrue. The major complaint was that the book chains would force publishers to take a pass on publishing important books in favor of “mindless” bestsellers. But with 350,000 books published in English last year that prediction has also proved false. Furthermore the numerous book superstores ordinarily feature a far broader inventory that the average independent bookseller. Online bookselling by Amazon.com and its competitors has had an enormous impact on bookselling. Now anyone can quite easily obtain any of the 300,000+ new books that can’t be found in the retail channel. The result is that never have so many different books been so easily, readily and inexpensively available. This section links very clearly into the next. The premise is one that I often observe: a technology develops or evolves and a new industry (or sub-industry) is born. The improvement in print-on-demand (using a generic name for this type of print manufacturing) over the last decade has been astounding. As discussed elsewhere, most book publishers grew up in an industry where the consideration was between printing 3,000 copies or 5,000, hoping to shave perhaps 10-15% off the manufactured cost. What happens when you can print one book for 120%/per unit of the price of 3,000 books? An industry changes. The book publishing industry has changed because this is the new reality. Vanity publishing always had a bad name. The concept was that some sucker would pay some huckster to print several thousand copies of their “terrifically important” manuscript that somehow had been cruelly overlooked by 300 New York agents and publishers, and turn that into the bestseller it had always deserved to be. Of course there were a few success stories to fuel the flames, but in many cases naïve authors found themselves with a large invoice and 2,999 copies of their book in the bedroom cupboard. The big difference is distribution. In the old days of vanity publishing, those publishers had few mechanisms for book distribution, and even fewer chances of having their vanity publications taken seriously by any of the mainstream book reviewers. In the age of the Internet, distribution issues are significantly muted, and the reading public has discovered that they don’t necessarily care what The New York Times says about an inexpensive book covering a topic in which they’re interested. This has led to the blossoming of Lulu.com and its many brethren (see References for more information on Lulu.com), and I for one, will not lament the end of New York’s hegemony on deciding what should be purchased and read. For more information on the phenomenal growth of the self-publishing industry, see my blog entry: More Data on the Number of On-demand Titles in 2008. The survey asked respondents if during the previous twelve months they had read any novels, short stories, plays, or poetry in their leisure time (not for work or school). As the report notes, included were “popular genres such as mysteries, as well as contemporary and classic literary fiction. No distinctions were drawn on the quality of literary works.” Literary non-fiction was apparently not included. What is most notable in this first chart is an important anomaly between the number of literary readers and the percentage. Because of population increases, the total number of readers is constant over a 20-year period, while the percentage decline, as illustrated in the next figure is 7.3%, and by 2002, the rate of decline had increased to 14%! It’s somewhat cold comfort that the rate of decline in the reading of “any book” decreased by half of the percentage of the decline in the reading of literature. Not many will be surprised, though most of us will remain concerned, that the decline in reading is most pronounced in the young, although the following chart encompasses those up to the age of 44! Even the “elderly” are partaking of the slaughter, but in far more modest numbers. Looking at similar results from a slightly different statistical perspective, while the U.S. population increased by nearly 40% between 1982 and 2002, the percentage reading literature dropped by just over 10%. What conclusions to draw from this arguably grim data? I think that the pessimist’s viewpoint is well-represented by these charts (and more so in the original report – recommended reading). But it is worth focusing on the brighter side of the picture. Two data points stand out: while there is a clear shift away from literary reading, the reading of the broad range of books published does not show as steep a decline. Also, the North American population will continue to increase, and this will to some extent ameliorate the trend from the publishers’ perspective – although the nature of what they publish will have to change if they wish to hold their own against the trends so clearly illustrated here. Nearly half of all Americans ages 18 to 24 read no books for pleasure. 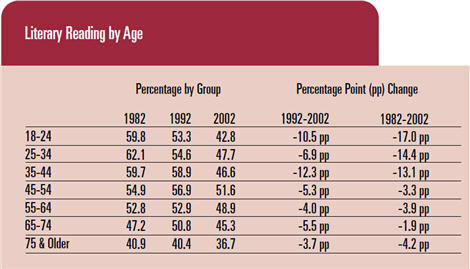 The percentage of 18- to 44-year-olds who read a book fell 7 points from 1992 to 2002. The percentage of 17-year-olds who read nothing at all for pleasure has doubled over a 20-year period. Although nominal spending on books grew from 1985 to 2005, average annual household spending on books dropped 14% when adjusted for inflation. What makes this report both more important and more unsettling than its predecessor is that it is of course more timely, but also that it moves beyond the single category of “literary reading,” taking a broader view of publishing. And that broader view is a bleaker view. While the book publishing industry has begun to come to terms with some of the opportunities afforded by the Internet, I fear that this is thus far a case of too little, too late. Of course it’s not merely missed opportunities on the Internet and the Web. More fundamentally, it appears that competing media are slowly eroding the economic base of publishing. Twenty years ago television and music were distracting for the young. In combination with chat, social networking sites, mobile phones and more, the book has certainly met its match. (c) As quoted at the beginning of this piece, “Bowker, the world’s leading provider of bibliographic information, released statistics on English-language book publishing compiled from its Global Books In Print database. (d) Self-publishing guru Dan Poynter has a fascinating smorgasbord of publishing stats on his site, although last updated March, 2008. 4. What Did Gutenberg Invent? This fascinating Web-based series of articles challenges the most fundamental claim about Johannes Gutenberg: that he in fact was the European inventor of printing using movable type. Researchers Paul Needham and Blaise Aguera y Arcas have made a new discovery that throws doubt on this long-cherished belief. As the article notes: “Paul and Blaise’s findings suggest that the development of the printing process was more gradual than previously thought…. Their working hypothesis on how Gutenberg created type is that a temporary mould was created, one letter cast and the process of taking the letter out of the mould disturbed the surface. So the same mold would have had to be recreated to make the second letter.” They conclude that the process for creating movable type in Europe was more likely discovered in Italy some 20 years later. Heidi Julavits’ superb short piece of creative nonfiction, The Writers in the Silos projects the future of publishing as nothing has before. According the August 2007 Harper’s magazine Harper’s Index (subscription required) a book of poetry must sell 50 copies per week to appear on the Poetry Foundation’s bestseller list.